The school was founded in 1544 by Gilbert Lathum, a local clergyman who left £140 in his will to fund a schoolmaster (at a stipend of £7 per year) to run a free grammar school. The school was first based in Church Street opposite the Prescot Parish Church of St. Marys. It then moved in 1760 to a site in the High Street where it remained until 1924. The next move was to the spacious site on St. Helens Road accommodated in newly built wooden buildings which were supposed to be temporary, expanded and augmented in the 1960s by a brick built hall (The “Spencer Briggs Hall”) classrooms and purpose built metalwork and woodwork workshops but they remained until 1978 when it was the victim of an arson attack by a disturbed former pupil. Famous headteachers include C.W.H. Richardson who ensured its survival during difficult times in the 1920s and 1930s and R. Spencer Briggs from 1937 to 1963. None of the others were of note. Geoffrey Dixon was a stalwart of the twentieth century and taught at the school for 42 years from 1927 to 1969 reaching the position of Deputy Headmaster. One can only speculate why he never achieved ultimate status. By 1944 when the Butler Education Act brought the school into the free national system, the school was in fact charging tuition fees. At this point, entry criteria passed from the ability to pay to the ability to pass the 11+ exam. In 1956, Prescot Grammar School for Girls opened on a new site in Knowsley Park Road. Miss Joan Keay became the long serving headmistress until the school became a comprehensive. From the 1930s to the 1960s the boys school expanded under the control of headmaster R. Spencer Briggs to a peak of 650 boys. Briggs also modelled his school superficially on the British Public Schools with a prefect system, school uniform, and a heavy emphasis on games (particularly football and cricket). and indeed corporal punishment. There was also rich extra-curricular activity (debating, amateur dramatics, choral and instrumental music, and a plethora of school societies. 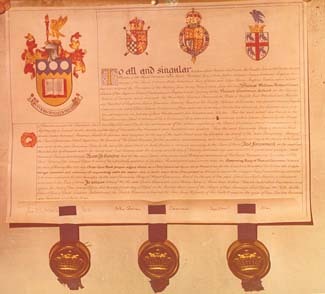 During this period the school applied for and was granted its coat of arms. The Latin motto Futuram civitatem inquirimus’ translates as “We are seeking a future state” In other words “Looking forward”. In 1975, it became part of the newly-formed Metropolitan Borough of Knowsley, and joined with Prescot Grammar School for Girls (founded 1955) to become Prescot Comprehensive School. The school moved to the Girls’ School site and the extensive playing fields of the Boys’ School in St Helens Road were sold off and are now covered by a housing development. In 2000 Prescot School gained specialist status as a Language College.